WriteMyEssayOnline has to be a new service, since I’ve never noticed it before. At first sight, the website looked nice and reliable. However, I encountered a problem as soon as I tried to discover the prices: there is no pricing chart.There is a basic order form that requires you to enter the type of your project and the deadline. I did that, clicked continue… and nothing happened. I noticed that the form required an email. That’s really inconvenient, since I started getting messages by the service every day until I decided it was enough: “okay, I’ll order the paper to see what you can deliver.” And after that WriteMyEssayOnline.com Review appeared. I couldn’t find any trustworthy reviews of this service. The testimonials at the website don’t seem realistic: you’ll read a single word like great or thanks, along with a rating of 10 stars. The website itself is not that scary in terms of design, but it’s simply not informative enough. The fact that you can’t see the prices without starting the order process makes me sad. How do I know I want to place an order if I don’t know how much it will cost? Surprise, surprise: there is no separate page that lists the services. However, you can easily see what types of papers the company offers if you open the dropdown menu in the order form. You can order any type of essay, case study, business plan, creative writing assignment, research paper, term paper, and even thesis/dissertation paper. Before we get any further, I want to clarify something: I wouldn’t recommend you to order any complex type of content from this service. I can’t really tell you much about the prices. I got a quote of around $50 for my essay with a deadline of 3 days. That seemed pretty affordable when compared to other services. The company has a no-discount policy. It keeps the rates pretty affordable and it doesn’t offer discounts to anyone. I would forget all about the complicated ordering process and unnecessary email messages if the service delivered a decent essay. The writer was incapable to write a paper of high quality. I got a simplistic piece of content suitable for a high-school student. 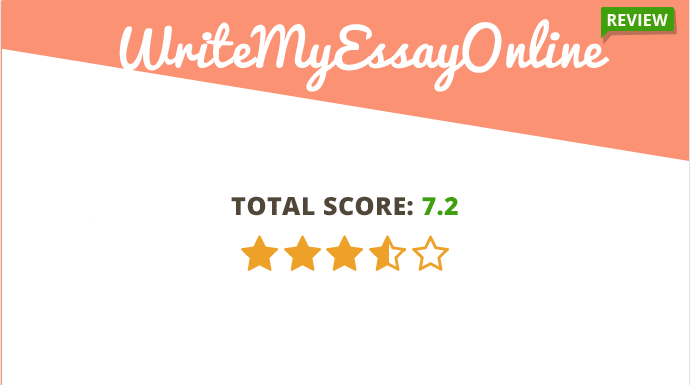 The fact that I requested the highest level of quality speaks enough: WriteMyEssayOnline is not the best choice for those of you who want to get the best essays for an affordable price. The support team operates 24/7. However, you can’t access the support via live chat before opening an account at the website. This company believes in direct communication between the writer and the customer, which is why the support system doesn’t function that well. The only problem is: my writer didn’t bother answering my messages either. This is probably the only positive comment I made in this review: the blog section at WriteMyEssayOnline.com is pretty cool. There are different articles that teach students how to create PowerPoint presentations, improve their concentration, choose the most suitable college, and so on. In conclusion, I have to say that there are much better choices for custom-writing services on the web. WriteMyEssayOnline has potential, but it has to work on the aspects of transparency, ordering convenience, and quality in order to become competitive in the custom-writing industry. Am I the only one with this opinion? Please comment to share your experience. Are you kidding? These guys are scammers! They charged my card and delivered my essay in three hours after deadline! I failed to submit it and right now I cannot pass my exams. Many thanks for terrible service!